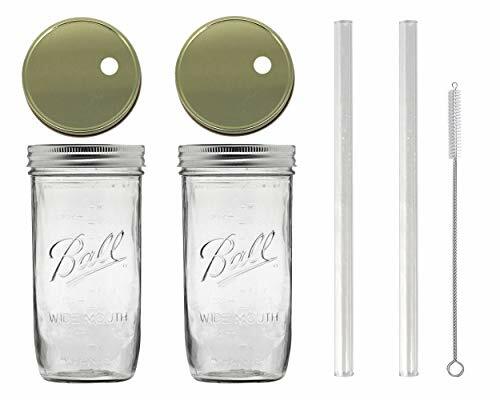 These 24oz glass jars can hold your green smoothie, coffee, tea, or any beverage of your choice. It will look amazing in your hand when you are on the go. Glas straws for the nutritious green smoothies you make! DISCLAIMER: These straws are made of durable Borosilicate glass. However they should be inspected for cracks or chips before each use. Children should be supervised by an adult at all times. GLASS STRAWS MADE IN THE USA - Each straw is handmade by glass artists and thoroughly inspected by hand for quality and defects. Certified BPA & Lead free glass. No Chinese glass or materials. LIDS: HAND WASH AND HAND DRY TO PREVENT OXIDATION. Convenient one piece lid with 10mm Straw Hole. Made in the USA! These straw hole lids are made of tin plated steel with a plastisol liner. One piece screw top, BPA free, made of metal material, with rubber seal. Metal lids look amazing are much better quality and have much longer longevity and life span than plastic Mason jar lids. Sleek design. Tight Fit. The improved modern design lid is easy to use, no band is needed. BPA free. .